At Knight’s we get new products in almost daily, but recently we got a shipment of candles in from a new vendor called Habersham Candles that had the whole shop filled with the most amazing fragrances we’ve ever encountered. Immediately we opened the boxes to see what in the world smelled so wonderful. Like little kids at Christmas we were tearing away at boxes opening them up to check out these incredibly scented candles. Oh my gosh, the bouquet was amazing! That wasn’t the only thing that blew us away. The shape of these candles are unlike anything we’ve ever seen. 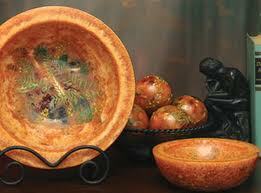 While many candles are in jars, these extraordinary candles are in the shape of a bowl or a round sphere. The colors are striking with little hand panted flowers on the outside of the candle. Describing these candles really can’t do it justice. You just have to see them for yourself. They’ll take you breath away. If the fragrance and the appearance of the candle isn’t awesome enough, get this…it’s releases it fragrance without having to be lighted! No more messy, melted wax or awful black soot. You won’t have to worry about the kids accidentally knocking the candle over starting a raging fire. These marvelous candles will continue giving off a scent for at least 6 months. Some people have claimed they still retain their fragrance up to 2 years! 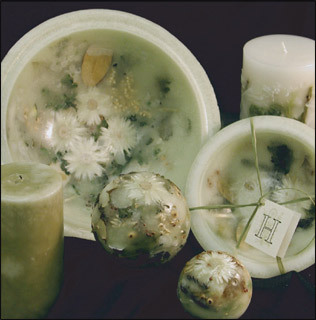 We have an exclusive to Habersham Candles in our area. Come by our shop and see why Habersham Candles are the hottest selling candles in the gift industry today with alluring fragrances like Chocolate Orange, Sunflower Lemon Vanilla, Mahogany Apple, Harvest Home, Cranberry Spice and Sage among others. Come in an see all of the different fragrances we carry or view them online on our Habersham Candle Page. We can deliver them in our delivery area or ship them anywhere in the USA. Doesn’t the scents of a wonderful candles remind you of fond memories of the past? Visiting grandma for a big thanksgiving dinner. Trip to the beach. Maybe a Christmas when you were just a tot growing up.